The A Link Between Worlds 3DS XL was officially announced for North America today in the video you see above. The system will launch alongside A Link Between Worlds on November 22 for the retail price of $219.99. The full press release can be seen after the break. REDMOND, Wash.--(BUSINESS WIRE)-- The Legend of Zelda series has always been associated with the color gold. From the original gold-colored cartridge for The Legend of Zelda on NES to the box art of the recently released The Legend of Zelda: The Wind Waker HD for Wii U, when fans think of “Zelda,” they think of gold. With the launch of The Legend of Zelda: A Link Between Worlds on Nov. 22, the tradition of gold continues. 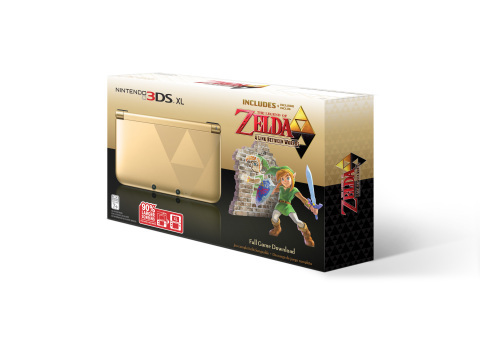 On the same day, a new Nintendo 3DS XL bundle will launch that includes Nintendo 3DS XL hardware with gorgeous gold-and-black coloring and the iconic Triforce on the exterior, as well as a download code for The Legend of Zelda: A Link Between Worlds. The legendary system is gold on one side and black on the other, beautifully representing the two parallel worlds Link travels between in the game. The special bundle was announced in a video starring The Legend of Zelda franchise producer Eiji Aonuma, and will be available at a suggested retail price of $219.99. The Legend of Zelda: A Link Between Worlds is set in the same world as fan-favorite The Legend of Zelda: A Link to the Past for Super NES and takes place in the same Hyrule after many years have passed. In this new game, Link must journey between two worlds, Hyrule and Lorule, using a mysterious power that lets him become a drawing on walls. Link's ability to merge with walls allows players to solve puzzles and explore dungeons in a new way. Players are also able to buy or rent various items throughout the game, allowing them to explore dungeons in any order they want, adding a new level of freedom to the game play. 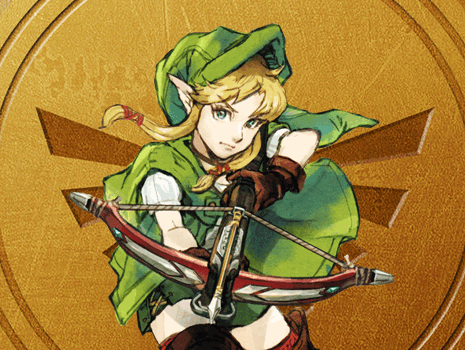 For more information about The Legend of Zelda: A Link Between Worlds, visit //zelda.com/link-between-worlds/.